Although certainly one of the darker shows along with Courage the cowardly dog around the time, it had a mastered the technique of mixing both Humor and Darkness in the same show. At first glance, you can see the Grim Reaper, but its not what you may think. Some art people drew, makes it seem 100x darker than it really is. 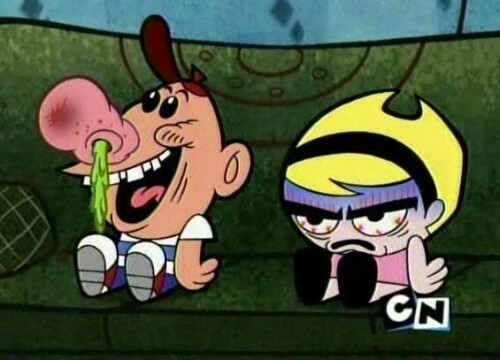 In this show we see 2 kids named Billy and Mandy. Billy the irresponsible, immature, boy with thought to have the lowest IQ ever, and Mindy the crazed devilish child who is very arrogant and controlling. She is even feared by her parents! When billy wins a limbo contest he is awarded with the Grim Reaper to forever be his slave. 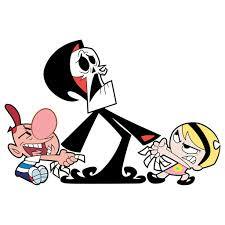 Although Grim has a vast amount of powers, he is forever under control of Billy and Mandy. 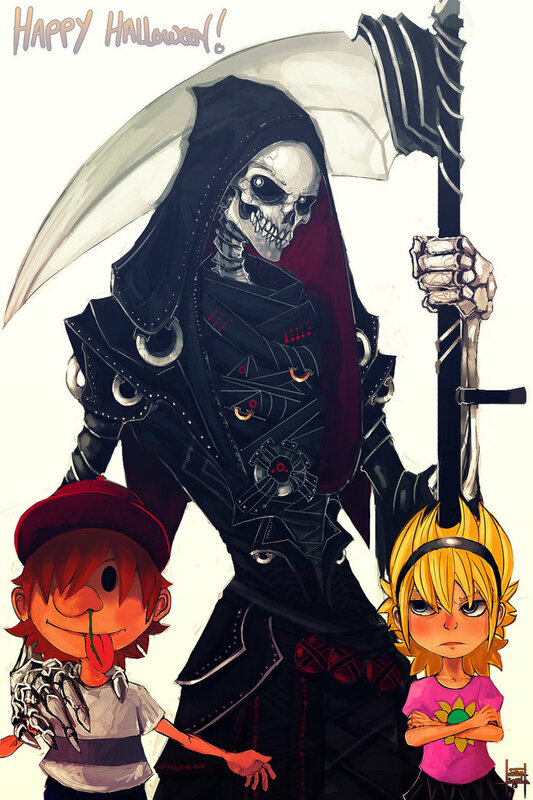 Billy and Mandy fighting over Grim. This brings them through different events each episode from an evil invisible duck to a talking human sized spider who thinks Billy is his father. Although there is no main villain, we see occurring problems throughout the series. 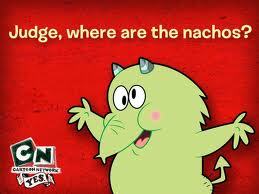 Such as the Chaos apple, Fred Fred Burger, even the Boogeyman. 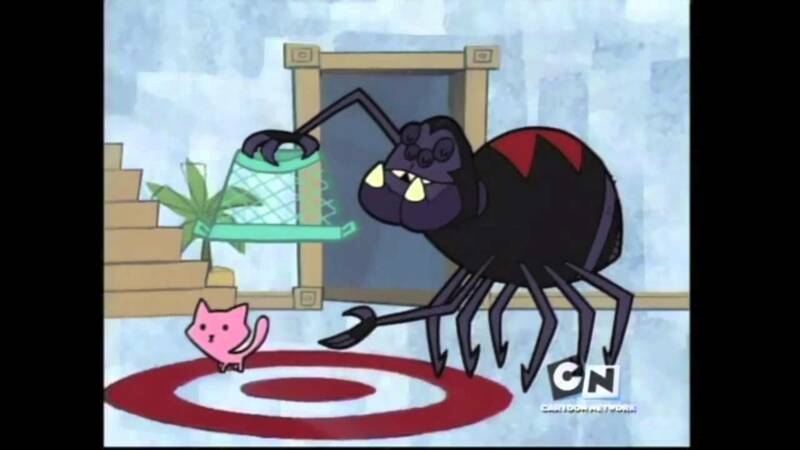 Most problems are cause by Billy and Mandy’s miss use of Grim’s power or Grim’s past coming back to haunt him. Even though these characters might seem scary and evil for a kid, its pretty humorous at times, making it a perfect mix of both genres. Some are darker than others, and some are the other way around. For example, Fred Fred Burger. This character is just plain humorous. What ever he does, puts a smile on any ones face. Fred Fred Burger eating frozen yogurt, while he repeatedly gets brain freezes. One of Fred Fred Burgers most famed phrases. With hundreds of humorous moments, there is still a sense of tension. You never know what’s gonna happen. But one thing I know is that it will be very very crazy. For example, when grim changes billy grade from an F to an A for a grade, he changes fate and reality is thrown off balance, so they must go back in time to stop himself from helping billy. Doesn’t sound crazy? How about this? Just a normal day when billy, mandy, and grim are abducted by cheese addicted aliens from the moon… Maybe the episode where Grim, Billy, and Many have to save christmas, as Santa has been bitten by a vampire. To save santa they need o find the head vampire, which turns out to be Ms. clause. I know, crazy right? At the end of the day, this is a great show and recommend it to all. With its A+ humor, and great episodes. It’s a nice mix of craziness, darkness and just plain humor.